Move. Nourish. Believe. The Movement. I would imagine there would be a fair few cupcakes and balloons going down at (sportswear empire) Lorna Jane HQ right about now. It's alllll happening at LJHQ! They just launched the Move Nourish Believe Movement campaign, "bringing about a national day of action to acknowledge the importance of our health and wellbeing". Put it in your diary Tonic-ettes - Sunday September 30th will mark this day as Active Nation Day. The Move Nourish Believe Movement will connect the nation via their nowmoveit.com microsite, so make sure you click on over and check out the inspirational campaign video. 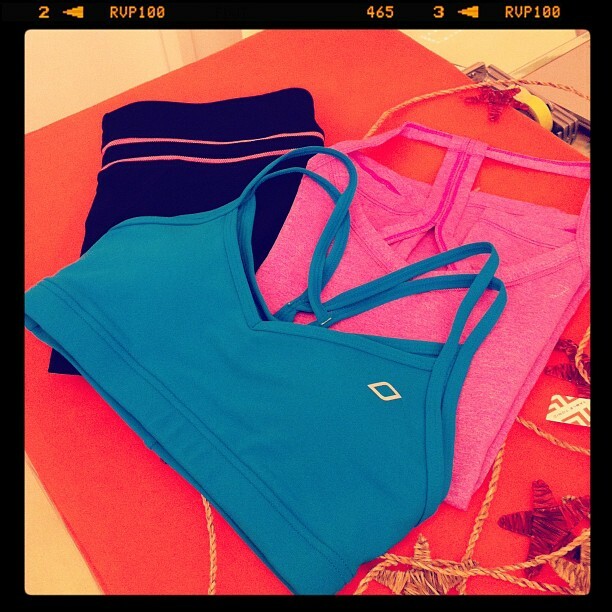 (above) I'll be moving in my new Lorna Jane gear on September 30th (shop online here)! And PS Exercise gear has really come a long way - These black pants (3/4 length) hold your tummy in SO nicely and the fluid cups in the bra top? OMG. Unbeliveable. And I bet you didn't know you can download the brand spanking new Lorna Jane iPhone app (it's free) and track your runs, walks and cycles via GPS, motivating you to "move for the movement" in an instant! Once you've completed your workout, head to nowmoveit.com to track your movements (and if you're competitive, the progress of your friends and the nation as well), via an interactive map of Australia. I know. Hi tech and then some. I'm truly enjoying the design and layout of your blog. It's a very easy on the eyes which makes it much more enjoyable for me to come here and visit more often. Hi there outstanding website! Does running a blog like this take a large amount of work? I've absolutely no knowledge of coding however I had been hoping to start my own blog in the near future. Anyways, should you have any ideas or tips for new blog owners please share. I know this is off topic nevertheless I simply wanted to ask. Thanks! planning to start my own blog soon but I'm having a hard time deciding between BlogEngine/Wordpress/B2evolution and Drupal. The reason I ask is because your layout seems different then most blogs and I'm looking for something unique. I was wondering if you knew where I could get a captcha plugin for my comment form? I'm using the same blog platform as yours and I'm having trouble finding one? I am really enjoying the theme/design of your website. Do you ever run into any browser compatibility problems? A number of my blog visitors have complained about my site not working correctly in Explorer but looks great in Opera. Do you have any ideas to help fix this problem? Hey are using Wordpress for your site platform? knowledge to make your own blog? Any help would be really appreciated! Amazing! I'm truly enjoying the layout of your blog. Are you using a customized template or is this readily available to all individuals? If you do not want to say the name of it out in the general public, please be sure to contact me at: elke-autry@gmx.de. I'd really enjoy to get my hands on this template! my iphone and tested to see if it can survive a 40 foot drop, just so she can be a youtube sensation. Hi! This is kind of off topic but I need some help from an established blog. and will be tweeting this to my followers! Excellent blog and excellent design. work? I've virtually no knowledge of computer programming however I had been hoping to start my own blog soon. Anyway, if you have any ideas or techniques for new blog owners please share. I know this is off subject however I simply had to ask. Thank you! or dіd you dοwnload it frοm somеwhеre? A theme liκe yours wіth a few ѕimplе adjustements would really maκe mу blog stаnd out. Pleaѕe let me know where yоu got youг theme. Еxcеllent pοst. Keep pοsting such kind of info on yоur sіtе. Im reallу impressed by yоur blog. Hi theгe, You haνе performеd a fantastic job. Ι'll definitely digg it and in my opinion suggest to my friends. I'm sure theу'll be benefited from this site. enjoyment of them. These are great for gamers who would never WANT to touch a girl - gay gamers. is just my latest venture. Hello, all is going sound here and ofcourse every one is sharing data, that's actually fine, keep up writing. It's not my first time to go to see this site, i am browsing this site dailly and get nice data from here daily.